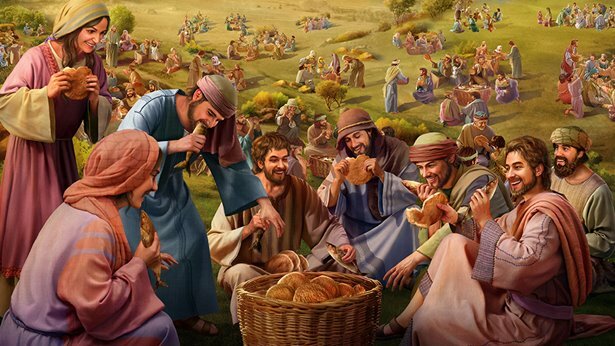 (Jhn 6:8-13) One of his disciples, Andrew, Simon Peter’s brother, said to him, There is a lad here, which has five barley loaves, and two small fishes: but what are they among so many? And Jesus said, Make the men sit down. Now there was much grass in the place. So the men sat down, in number about five thousand. And Jesus took the loaves; and when he had given thanks, he distributed to the disciples, and the disciples to them that were set down; and likewise of the fishes as much as they would. When they were filled, he said to his disciples, Gather up the fragments that remain, that nothing be lost. Therefore they gathered them together, and filled twelve baskets with the fragments of the five barley loaves, which remained over and above to them that had eaten. 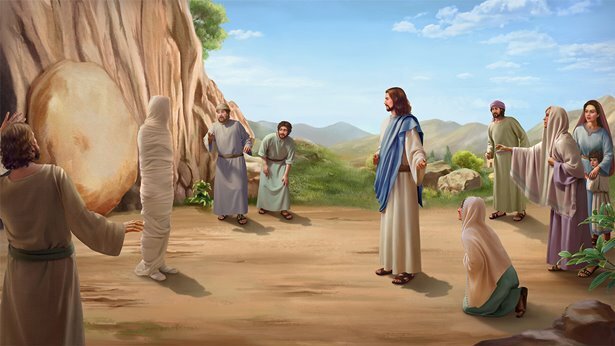 (Jhn 11:43-44) And when he thus had spoken, he cried with a loud voice, Lazarus, come forth. And he that was dead came forth, bound hand and foot with grave clothes: and his face was bound about with a napkin. Jesus said to them, Loose him, and let him go. First, let’s take a look at the first passage: Jesus Feeds the Five Thousand. What’s your impression after reading this passage? The significance of this miracle that the Lord Jesus performed was much greater than the previous one because no miracle is more astounding than bringing a dead man back from the grave. The Lord Jesus doing something like this was extremely significant in that age. Because God had become flesh, people could only see His physical appearance, His practical side, and His insignificant side. Even if some people saw and understood some of His character or some strengths that He appeared to have, no one knew where the Lord Jesus came from, who His essence truly was, and what more He really could do. All of this was unknown to mankind. Too many people wanted proof of this thing, and to know the truth. Could God do something to prove His own identity? For God, this was a breeze—it was a piece of cake. He could do something anywhere, anytime to prove His identity and essence, but God did things with a plan, and in steps. He didn’t do things indiscriminately; He looked for the right time, and the right opportunity to do something most meaningful for mankind to see. This proved His authority and His identity. So then, could the resurrection of Lazarus prove the Lord Jesus’ identity? Let’s look at this passage of scripture: “And when he thus had spoken, he cried with a loud voice, Lazarus, come forth. And he that was dead came forth.” When the Lord Jesus did this, He said just one thing: “Lazarus, come forth.” Lazarus then came out from his tomb—this was accomplished because of a single line uttered by the Lord. During this time, the Lord Jesus did not set up an altar, and He didn’t carry out any other actions. He just said one thing. Would this be called a miracle or a command? Or was it some sort of wizardry? On the surface, it seems it could be called a miracle, and if you look at it from a modern perspective, of course you could still call it a miracle. However, it certainly could not be called a spell to call a soul back from the dead, and absolutely not a sorcery. It is correct to say that this miracle was the most normal, tiny little demonstration of the Creator’s authority. This is the authority, and the ability of God. God has the authority to have a person die, to have his soul leave his body and return to Hades, or wherever it should go. When someone dies, and where they go after death—these are determined by God. He can do this anytime and anywhere. He is not constrained by humans, events, objects, space, or place. If He wants to do it He can do it, because all things and living beings are under His rule, and all things live and die by His word, His authority. He can resurrect a dead man—this is also something He can do anytime, anywhere. This is the authority that only the Creator possesses. When the Lord Jesus brought Lazarus back from the dead, He used one line: “Lazarus, come forth.” He said nothing aside from this—what do these words represent? They represent that God can accomplish anything through speaking, including resurrecting a dead man. When God created all things, when He created the world, He did so with words. He used spoken commands, words with authority, and just like that all things were created. It was accomplished like that. This single line spoken by the Lord Jesus was just like the words spoken by God when He created the heavens and earth and all things; it equally held the authority of God, the ability of the Creator. All things were formed and stood fast because of words from God’s mouth, and just the same, Lazarus walked out from his tomb because of the words from the Lord Jesus’ mouth. This was the authority of God, demonstrated and realized in His incarnate flesh. This type of authority and ability belonged to the Creator, and to the Son of man in whom the Creator was realized. This is the understanding taught to mankind by God bringing Lazarus back from the dead. That’s all on this topic. Next, let’s read the scriptures.